Too Many Sprinkles on a McFlurry? You're Fired! Should a McDonald’s employee be sacked for putting slightly too many sprinkles on a McFlurry? 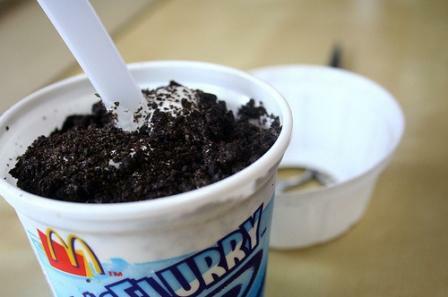 A 19 year old McDonald’s employee is claiming unfair dismissal after she was fired by the fast food giant for putting too much topping on a McFlurry. A fellow employee, who was purchasing a McFlurry, asked her to “make it a nice one” and so she did. She was a little over generous with the chocolate sprinkles and as a result lost her job. Before being dismissed, she was described as an exceptional employee and had no previous disciplinary record. The reason given for the dismissal was gross misconduct. It was said that she had effectively stolen food. Sounds unfair, doesn’t it? But is it? Was this an unfair dismissal? In order to win her case, she will have to do more than persuade the tribunal that the decision to dismiss was harsh or that she did not intend to be dishonest. The question is whether the dismissal was within the range of reasonable responses open to an employer. The tribunal will not have to decide whether she was guilty or not. The question is whether a reasonable fast food restaurant could have dismissed in these circumstances. No doubt, the employer will argue that if every employee were that generous then it would lose control of its stock and ultimately make less profit. An Employment Tribunal is likely to listen to this argument because an employer is entitled to adopt a zero tolerance approach to issues such as serving size and treat any breach as gross misconduct. The real issue is whether or not the employer communicated its strict approach to its staff. Should an employee in Sarah’s position have understood that a generous helping of chocolate sprinkles would lead to her being fired? Did the notices in the staff room make it clear that it is gross misconduct to be generous with chocolate sprinkles or do they just say that theft of food will result in dismissal? I don’t know whether or not Sarah will win her case but it may not be quite as clear cut as she would hope. You should make sure that your disciplinary rules are adequately communicated to your staff. If you have rules that may come across as harsh, these should be clearly explained. It will not be enough to say that they are is a staff handbook unless you can show that the employees have read that handbook. If you require help with drafting or implementing disciplinary rules or procedures, please feel free to contact Andrew Crisp on 01604 601 575 or complete the form below. Previous Entry: Can you dismiss someone for having too much time off sick? Next Entry: What do You Do If a Member of Staff is Incompetent?